I’m not a big fan of cold weather, or Winter in general. It’s endless months of frozen toes, fingers stiff with cold, the shock of crawling reluctantly from a warm bed, bright red noses that won’t stop running. But despite the physical discomforts, I can find spots of cheer: tiny sparkling holiday lights everywhere, the rush of warmth from a cup of tea and a thick blanket, watching fat snowflakes flutter past my window. Soup, in my house, is most decidedly a cold-weather affair. You can make your gazpachos, and corn bisques, and chilled cucumber things all summer long; and they are certainly fine and well. But for my money, I’d rather have a proper meal of soup, a filling bowl of hot and deeply flavored stuff, far more than some thin, cold liquid that’s halfway to being a beverage. So soups are reserved for the cold, and I can scarcely think of a better way to warm both you and your house than with a big, bubbling pot of broth. I made this particular soup the other day, when a craving for mushrooms struck me hard, and the chill creeping in through the windows demanded a bowl of something hot. Browsing through my bookmarked recipes, I came across a recipe for Buttermilk Squash Soup, from Heidi of 101 Cookbooks. And, as luck would have it, I just so happened to have a bit of good-quality leftover buttermilk knocking about in my fridge, threatening to go South if I didn’t use it post-haste. 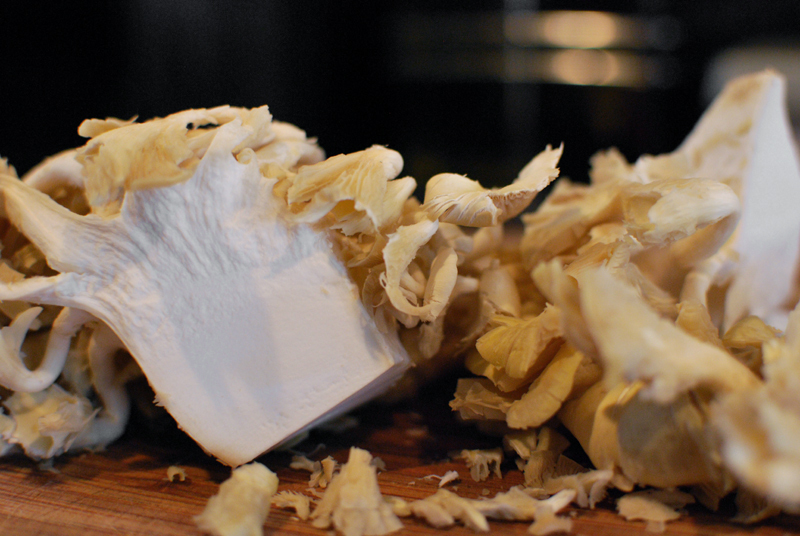 Knowing mushrooms’ affinity for things creamy and tangy, I decided that buttermilk-enriched recipe was the perfect starting point. 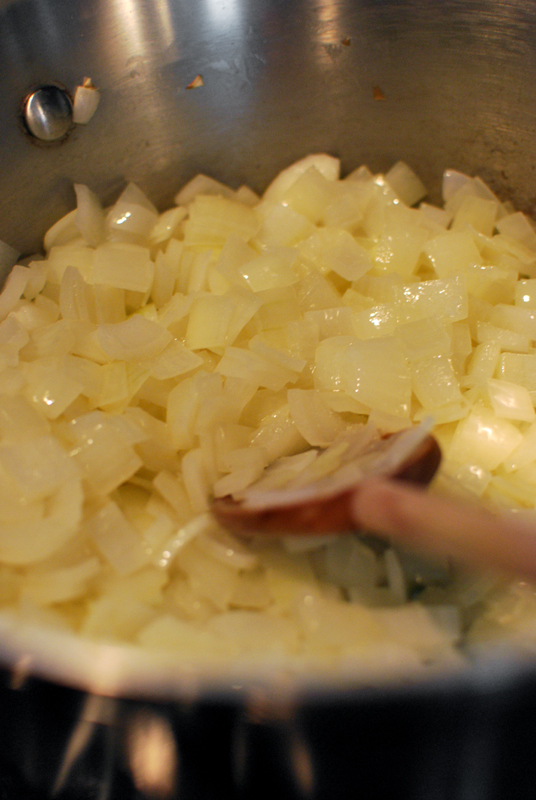 Using the loose framework of “make soup” and “add buttermilk at the end”, I patched a recipe together starting with a base of plenty of onion and garlic, with a potato thrown in for some body. When making soup, after sweating the vegetables together I like to deglaze the pan (whether it needs it or not) with a spot of wine, or some other liquor, or even beer, depending on the primary flavor of the soup. Alcohol, scientifically speaking, opens up different and more complex flavors than can be achieved without it, especially in slow-simmered things. And, you know, if some happens to accidentally spill into a nearby glass, it would surely be a crime to let it go to waste. Purely on accident, of course. In this soup, I used a combination of white wine (since I had some) and only a splash of brandy, as brandy and mushrooms are great friends, but I didn’t want the other flavors to get overwhelmed with its strong caramel and vanilla nature. A generous dose of thyme added a light, herbaceous note to complement the earthy mushrooms. I personally prefer soups with a few bits of items in them, so a few handfuls of mushrooms were set aside to be added in later, after cooking and blending the other ingredients to a smooth purée. Soups are simply more interesting if you have things in them to chew on. 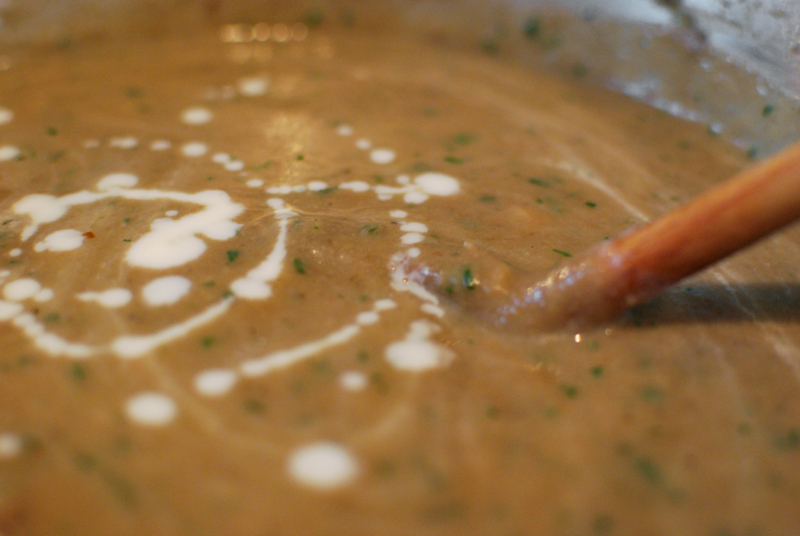 To prevent the buttermilk from possibly separating or curdling, the soup was cooked and puréed first, and the buttermilk added at the last minute, along with some fresh parsley for a little brightness. A quenelle of pesto on top was a welcome garnish, but if you have none on hand, a swirl of good olive oil is just as lovely. 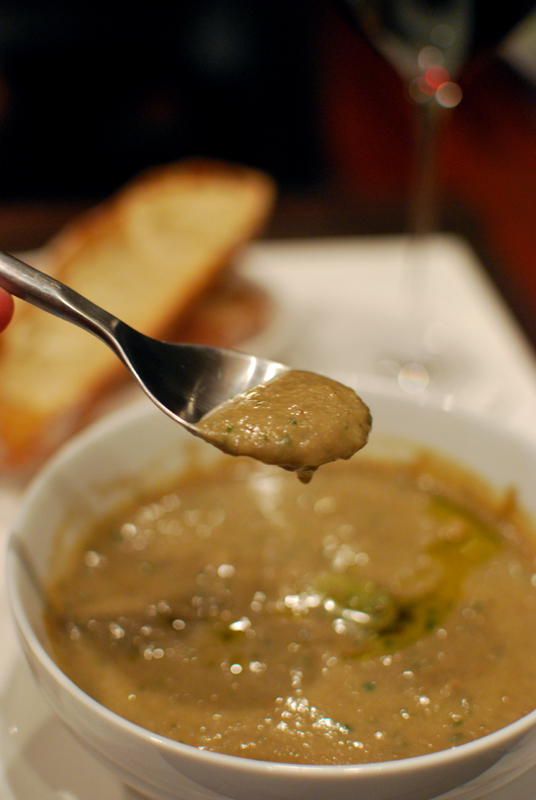 Thick and full-flavored, robust and so slightly tangy, this soup was exactly what I wanted on that cold evening. Despite its drab hue, it was the prettiest thing I’d seen all day. It warmed, and comforted; and if there’s more soups like this in store for me this Winter, I say bring on the cold. This is a fairly thick soup, one with a bit of heft to it. 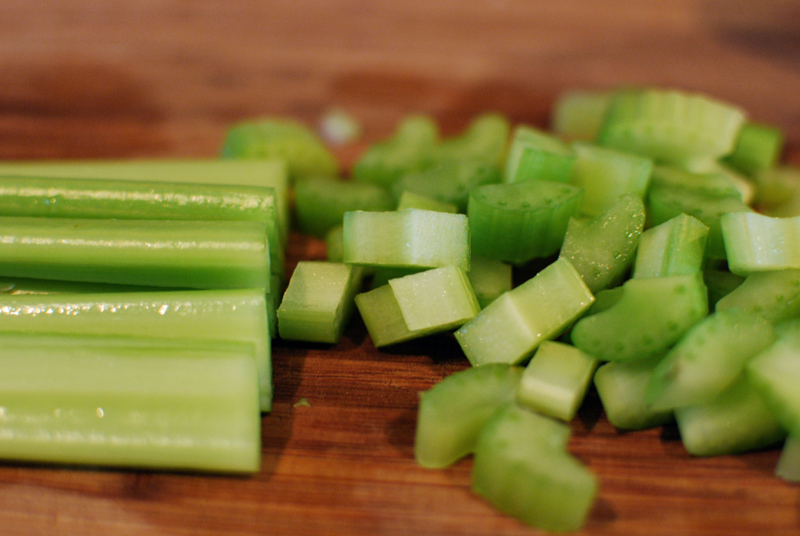 If you prefer a thinner soup, just add additional water or stock to thin it to the desired consistency. 1. 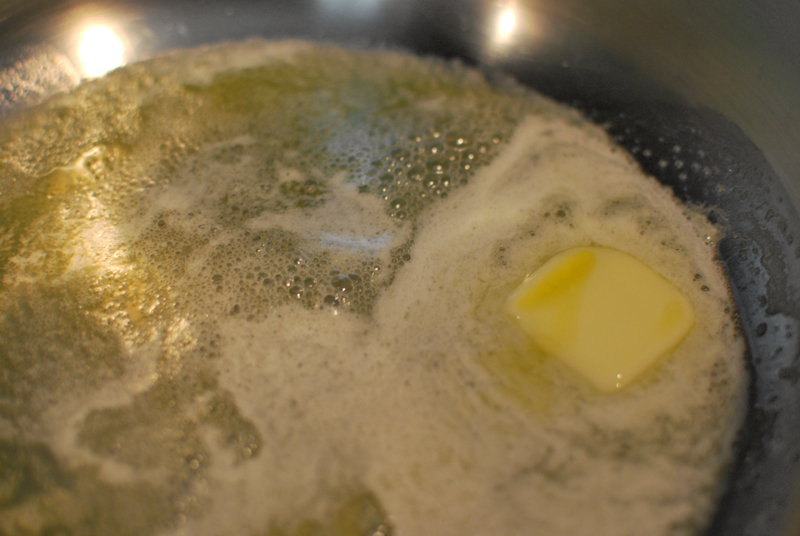 In a large pot, heat the butter and olive oil together over medium-high heat. 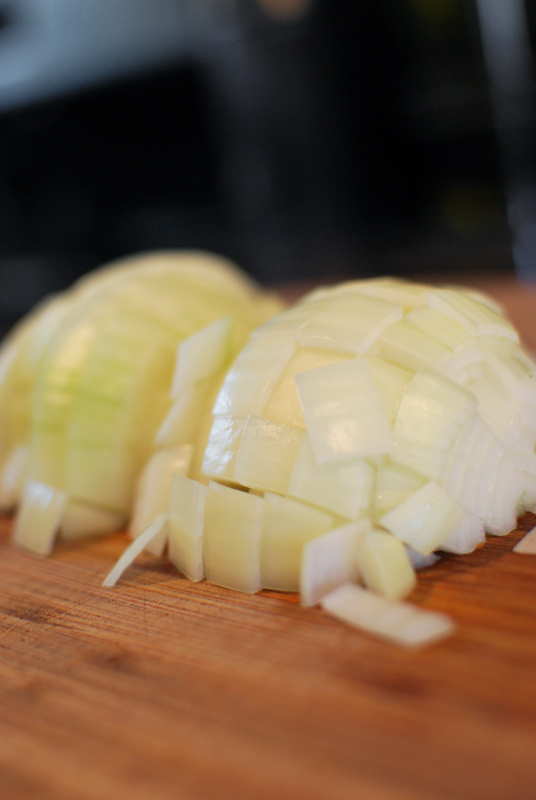 Add the onions, and cook until just translucent, 5 to 10 minutes. 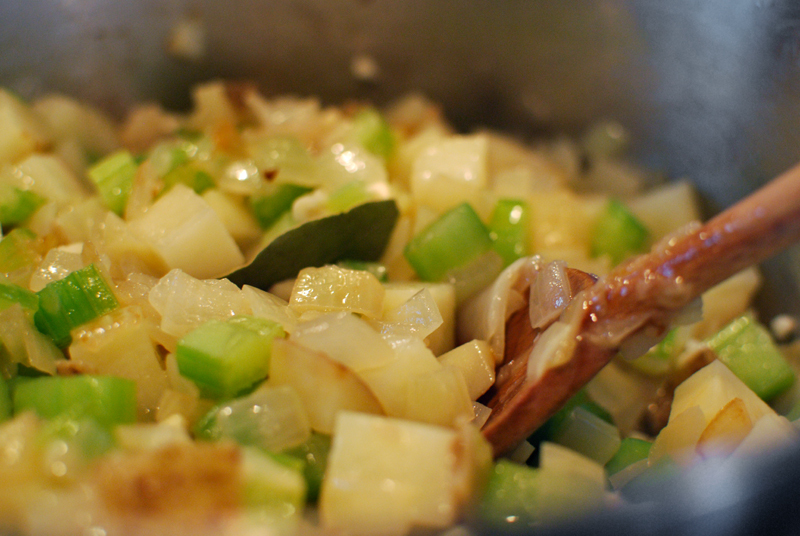 Add the celery, potato, and garlic, and cook until softened, another 5 to 10 minutes. 2. 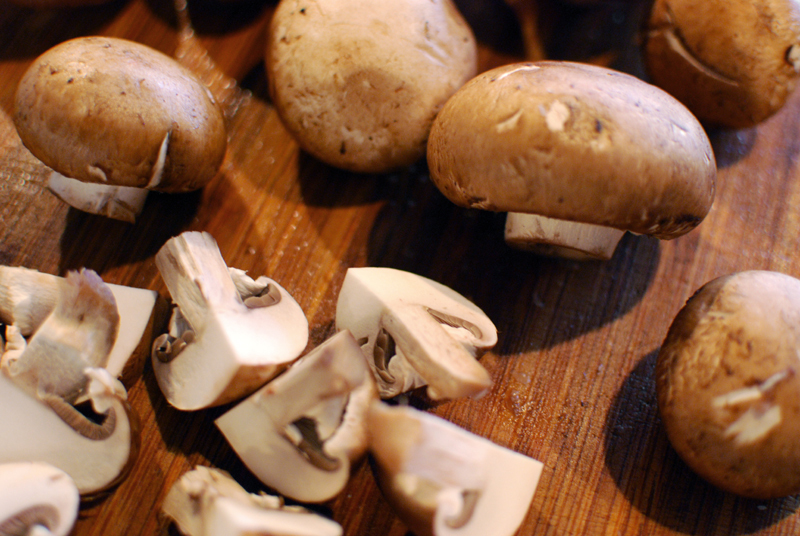 Meanwhile, chop the mushrooms into 1 inch pieces as needed. Reserve about 2 cups, to be added in later. 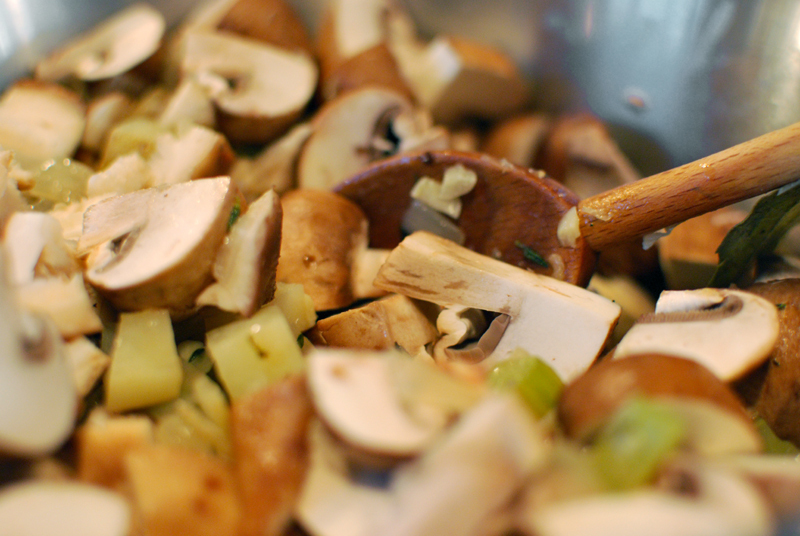 Add the remaining mushrooms to the pot, and cook until softened, about 5 minutes. 3. Add the white wine or vermouth, scraping the bottom of the pot to release any browned bits. Cook until nearly dry, then season lightly with salt and pepper. Add the bay leaf, thyme, and stock. Add enough water to cover all vegetables with liquid; you may not need much. Bring to a boil, then reduce heat to medium-low and simmer for at least 15 minutes, or until all vegetables are very soft. 4. Purée soup in the pot with an immersion blender, or by transferring in batches to a blender, taking care to hold the lid securely on when puréeing the hot soup. The blended soup will be very thick. Return soup to the pot, and add the reserved mushrooms. 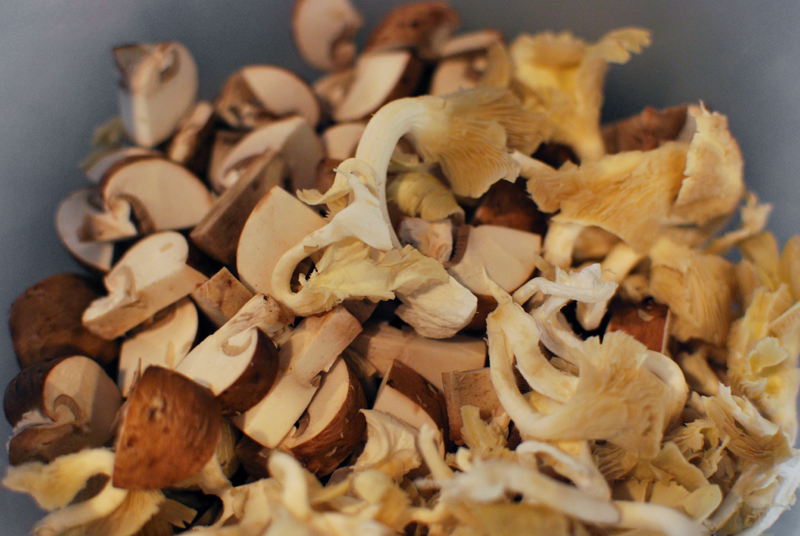 Cover and cook over medium-low heat for about 10 minutes, or until mushrooms have softened. 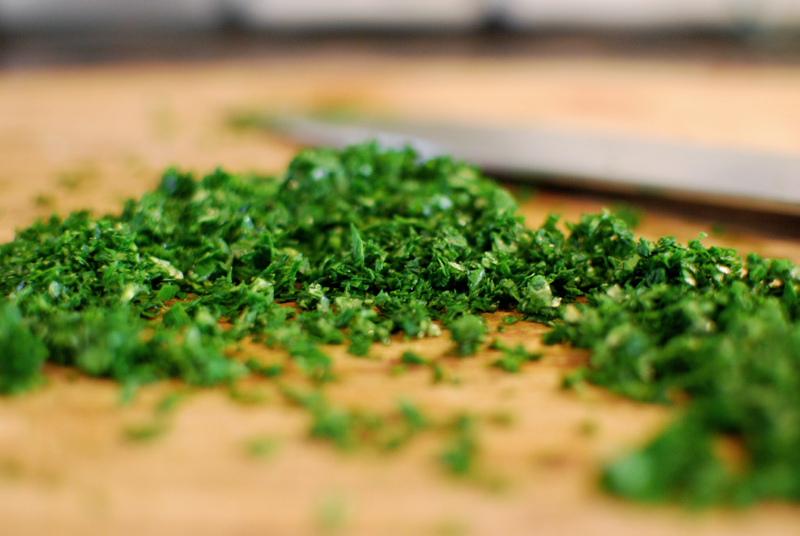 Add the chopped parsley and buttermilk. Taste, and correct seasoning with salt and pepper. Serve with a drizzle of olive oil on top and some crusty bread.